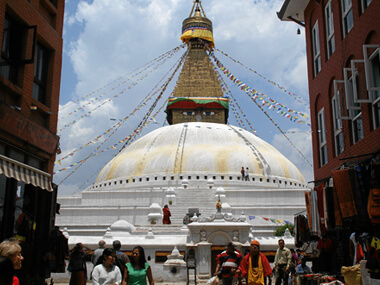 Kathmandu city tour covers three important cities of Nepal in this package. They are Kathmandu , Bhaktapur and Patan. They are historically important cities as well. During the monsoon, Trishuli River promises a more challenging ride, with powerful rapids and whirlpools. When the river is running high and wild, there are hardly any rafters around, and rafting on the Trishuli River is without a doubt the most exciting thing you can do in Nepal during monsoon and quite possibly one of the best two days big water rafting trips offered anywhere. There are many beautiful parks dispersed across the nation. Chitwan Notational parks offer you a unique opportunity to see different species of flora and fauna from the very close quarters. You can find several resorts in the Chitwan and they provide comfortable accommodation and delicious cuisine. They also offer many wildlife activities like safaris on Elephant's back, walk through the jungle safari and canoe trips. All these activities are carried out by the trained staffs. Chitwan jungle safari trip takes you deep into the jungle, beyond the beaten tracks. After completing Chitwan jungle safari tour, we go to Pokhara. And Pokhara is also one of the most charming cities of Nepal. Pokhara is the most beautiful city decorated by the combination of snow-capped mountain, translucent lakes, attractive streams and wonderful villages. Pokhara tour you will find friendly ethnic tribes there. You can see sun rising over the Annapurna Range and Fishtail Mountain. Your journey remains incomplete if you go back without visiting Pokhara. After breakfast, our city guide will come to the hotel with vehicles and then we visit Bodhanath, the Stupa of a Million Dew-Drops. We circumambulate the stupa with monks and devotees. Then we Visit Pashupatinath , Nepal 's most sacred Hindu temple dedicated to Lord Shiva, the destroyer. We see Hindu cremation along the banks of the Bagmati River. Day 08: Sight seeing in Kathmandu valley city tour. After the breakfast in the morning, our city guide will come to the hotel with vehicles and then, we visit the 5th century Swayambunath temple with its characteristic Buddha eyes that keep a protective watch over Kathmandu Valley . Better known as the "monkey temple", pilgrims climb up the 365 steps to the temple. This climb is optional. Then we drive to the Patan Durbar Square for lunch, followed by a tour of the ancient Palace Square and temples.